In the spring of 1754 James Isham, Chief Factor at York Factory, sent Anthony Henday inland to meet the native tribes and encourage them to travel to the Bay to trade. 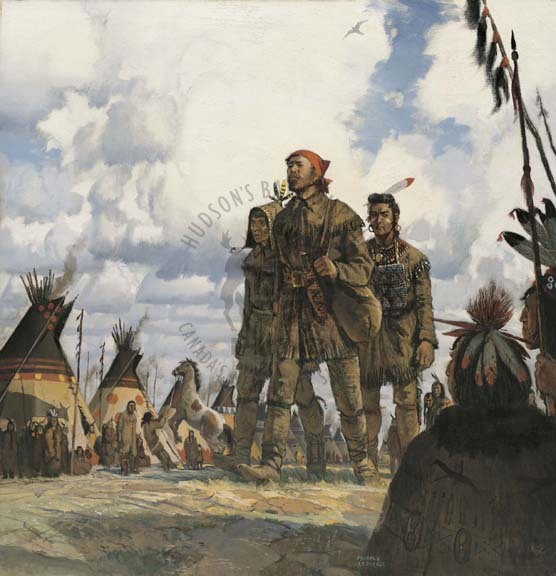 Henday accompanied a band of Cree on their homeward journey. On October 1st a group of seven Bloods entered his camp near Red Deer and exchanged gifts with him. Two weeks later his party encountered the huge main camp of the Blackfoot somewhere between present-day Calgary and Edmonton. Despite staying for several weeks and parleying with the Great Leader, Henday’s efforts to tempt the Blackfoot down to the Bay were unsuccessful. He returned to the Bay the following summer, arriving at York Factory on June 20, 1755, with a flotilla of over 70 fur-laden canoes. But the real value of his journey was in understanding that in order to maintain control over the trade and deal with competition the HBC would have to carry its business inland. It would be 1774 before the HBC would establish its first inland post.